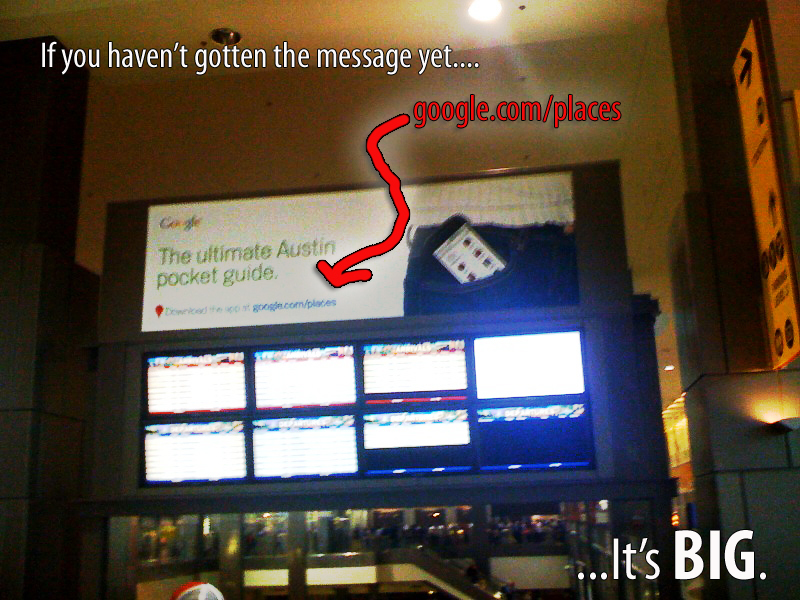 What are the chances that after leaving PubCon’s internet marketing conference in Austin TX that I would get a glimpse of Google’s 10 Foot banner ad in the Austin Airport? Let me spell that out for you…. 10 Foot Big in the case of this ad. So if you haven’t caught on yet, take note… Local Search is changing the game. Internet marketers are scrambling like a bunch of Austin TX fire ants after their mound has been kicked. Local results are showing up for searches like watches, shoes, and costumes. The example of costumes shared by BlueGlass is a little far from what I believe Google’s intent is. Google constantly refers to “Plumbers and dentists” as their local examples. These are truly local searches. Most people that search for a local service, like pest control, have an intent to buy locally. Restaurants would be the largest category here. The divide happens when we consider what is local? People in a rush to eat lunch are willing to pick up the closest burger. People looking to meet clients for lunch are looking for a joint with the right atmosphere. Chiropractic did a quick study of what influenced real people in their dinner buying habits for local search. 1- Recommendation. What are friends or reviewers saying. 2- Recognizing the Name. This would be more on branding. When you’ve reached the status of the Salt Lick or Rudy’s BBQ and people from Phoenix AZ know of you, you are doing it right. 3- Location. How close or how far. Sadly the Salt Lick lost out for the PubCon conference because it was too far. Better reviews but too far for our crowd of friends. BUT WHAT ABOUT LOCAL SERVICES THAT VISIT A CUSTOMER’S HOME? Yes. I have a little beef to pick with this one. A local service that covers the entire metro is totally different then a restaurant with only so much local pull. As good as the Salt Lick is, the customer must be willing to go the distance. Services that travel to your home, however, don’t require any more effort from a consumer. So as a consumer, if I am looking for an Austin pest control company, the 5 miles away or 50 miles away argument never really hits the table. As a consumer looking for a local Austin service, I am more concerned about “SERVICE”. So local results that cannot be sorted by 5 star reviews, or number of reviews, are a bit of a nuisance. Either way, the 1 ton Elephant of Local Search is on the loose…. and don’t call your local pest control guy about crazy roaming elephants …or gorilla’s. …. and FYI – Austin Airport hasn’t claimed their Google Listing yet. So I was actually having this dicussion with a SEO guy yesterday about Google bridging the gap between linking websites and GEO regions. Granted, and IP located in Russia is easy to spy. But what about on a local level. Does Google now consider local IPs a factor? Seems harsh for all the websites hosted on Godaddy. Finally is the question of Google Analytics. Google Analytics already provides regional/GEO data. You can already see where your visitors are coming from in a location sense. Now… We all know that Google doesn’t use anayltics to influence search rankings, but who’s to say they have not developed another indicator to determine a websites GEO influence based on a website’s visitors? Further, it’s not hard to imagine that Bulwark Exterminating is going to have more searches and hire visits from the regions that we service. So does your visitor’s location play into Google’s GEO results? And if so, how are SEOs going to work with ranking factor? BTW… Bing is also implementing GEO filters, just not blending the results quit like Google…. yet. So these questions would apply to them as well. Bing + Yahoo = 1..2…Punch! As many other marketers, watching the internet unfold and the movie reel movie rapidly into the future, the latest Bing and Yahoo merger has been one of this year’s highlights. From either side of the coin, this merger is intriguing. Google can take a short breath and breathe a gleeful sigh of victory, HA!… But wait this tag team just might knock some wind out of Google’s sail! I was honestly relieved and excited to hear this, Yahoo has been the most customer friendly search engine I have dealt with. I must say that Bing’s search results are impressive, so impressive that they seem to almost mirror Google’s search results. The fact that Bing has cut out the cluttered MSN page and provided a search page is going over well. The calming graphics are nice…. probably increases time on page… almost like slow music at a grocery store to keep you there just a little bit longer. So I give the search results an A…. Minus the maps. Local search seems to be the bane of the search engines and the marketers a like. Both are experience this sudden growing pain together. Bing will continue to maintain their local maps and local business listings, and Yahoo will continue to maintain their local maps and listings. My yahoo rep did promise me that Yahoo was investing heavily in their local maps. Yahoo is also introducing an applet in the search results for local areas. Bing Local Maps – Congrats! So the new feature is pure genius! It adds a personalized flavor to your search and helps the users get recommendations from friends. Overall it encourages further online conversation… which is what the internet is all about! Sneaky?… just a little. The function actually post the Bing url on twitter, facebook, or in your email. Smart though it titles your email for you and gives the results. I love it because if you lived in Vegas and emailed this list to your friends asking for recommendations… Bulwark pest control would definitely win! And of course the consumer would win… which is what the SERP should want. So hats off to Bing on this one! … of course they may want to remove that spam guy in position #5, A Executive Pest Control Insurance??? P.O. BOX??? Still, Bing is moving in the right direction.